These are my notes from the first day of the International Congress on Conservation Biology (ICCB) & the European Congress on Conservation Biology (ECCB) in Montpellier. I’ve took notes from some of the talks in 3 sessions about traditional knowledge, ‘Conservation 3.0’ and the citizen science posters. The role of tribal colleges in preserving traditional ecological knowledge and biocultural diversity – Teresa Newberry (Tohono O’Odham Tribal College in the US), the tribal colleges and universities (TCUs) in the US represent diverse communities and cultures. The Tribal Colleges has a mission to preserve the culture of the local nation, and engaged with their community, thus TEK is part of the education in them. Language is critical to understanding biodiversity: indigenous groups speak about 85% of world’s languages and take care of 80% of the World’s biodiversity (Nelson 2015) so it is important. There is a link between biodiversity and language diversity. Local languages encode local knowledge and they specifically adapted to their local area. 40% of the languages are in risk of disappearing and therefore this loss is monumental amount of TEK. Looking more closely, language encodes worldviews and traditional knowledge systems – it’s evolution of one group of people in a specific place, and also encode practices and rules. It includes many layers of meaning and relationships between living things. For example, in the Tohono O’Odham language there is a term that make you notice that you don’t collect the flower until a hummingbird collect the nectar – and it is included in the way you talk about local ecology. Teresa developed a local calendar that helps linking phenology to specific language and events. Another tool that she developed is the TOCC Plant Atlas – linking plants with audio that state the traditional name in addition to write it. 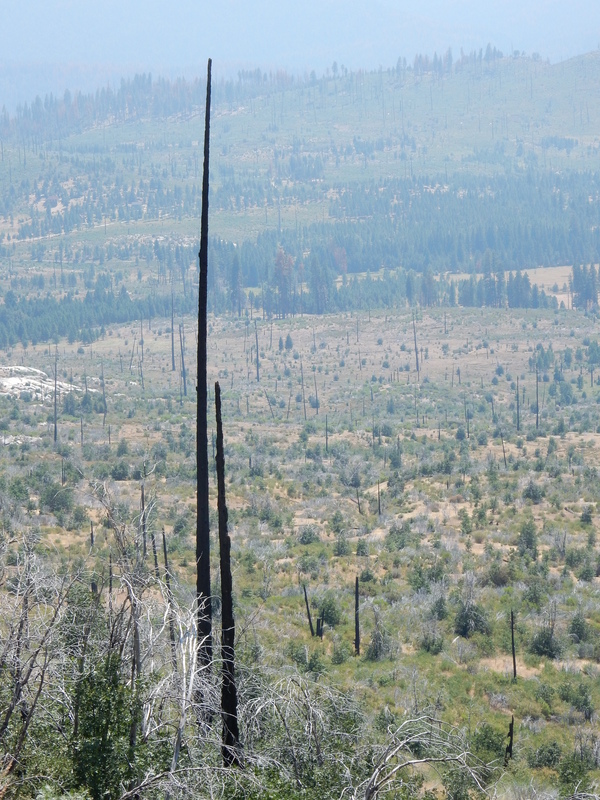 There are multiple values in traditional knowledge: unique multi-contextual perpectives, time-tested adaptation and mitigation strategies to environmental change and deep, local knowledge of place. ‘Manngem Thapnee’: The crocodile worship ritual of an agrarian community of Indian state of Goa, and its conservation context – Manoj Borkar (Goa University) – Goa is coastal and crocodiles are protected by the Red List of IUCN. The current trends is for the crocodiles population to increase and they have groups in swamps and some in fresh water areas. There are also tourism activities to see the crocodiles. The contemporary scenario – pressure of overexploitation of sand from riverbed, use of canals for shipping, unregulated backwater tourism, and fishing are making it difficult to protect the population. During the Portuguese control of Goa (450 years ago) there are reports on abundance of crocodiles. Crocodiles are viewed as demonic and also as divine status. Within the indigenous tribal culture there is a crocodile worship ritual in which they create a crocodile from clay and they want to appease the crocodile to avoid inundation of fields by water (the crocodile seen as the link to water sources) – the practice is going in December. The veneration is translated to protecting the crocodiles and can be seen as an example of integrating local practices in conservation. 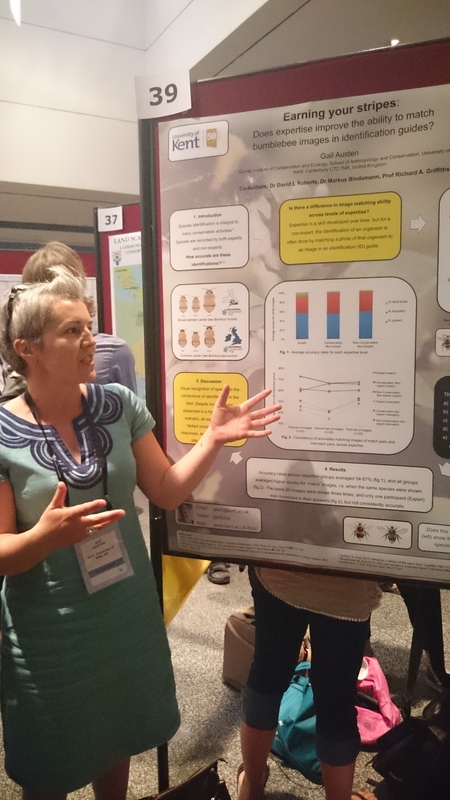 Augmenting survey data with community knowledge to inform a recovery strategy for an endangered species in Canada: Identifying important areas of habitat for Peary caribou – Cheryl Johnson (Environment Canada). The aim is to develop a recovery strategy for the caribou – to maintain healthy species distribution and keep their area – the are very wide ranging area species – migrating over hundreds of kilometres. The process started with identifying locations, then the amount that need to be protected, and then the very specific type of the habitat. This mean working at different scales. They collected survey information from scientists and integrated it with information from local communities of where they’ve seen the caribou. Once they’ve identified 3 main seasons in the migration, they integrated it into their spatial model. When comparing the information from survey information compared to community information – the community had much more holistic and complete view of where they’ve seen the animals. The modelling process include consulting with both scientific experts and community members with knowledge of the caribou and that helped in identifying the most relevant model. The TEK was crucial in eliminating spatial and temporal biases in survey data by scientists. The session Conservation 3.0 was open with Alex Dehgan explaining what it is about: technology, behavioural interventions and financial innovations are changing conservations. The field of conservation biology, after 30 years, there is increase in areas that are protected, but there are very high extinction rates, and we still have major challenges. The population growth will require 70% more food and the intensity of agriculture, especially with increase in meat consumption. Wildlife trade increase and we don’t have enough financial resources. Conservation biology is sometime technophobic, but how can we used opportunities to deal with issues? Maybe we should learn from other areas – e.g. the change from ‘tropical medicine’ to ‘global health’ – by increasing the tent to more people involved from more areas of research. We can have conservation technology & engineering. 3D printing to cellphones, we can consider the connected conservation and the used of multiple sensors, or use synthetic biology. There is also need to consider how to use ideas from behaviour change, marketing & conservation – altruism doesn’t work, only as last resort. Financial innovations – maybe environmental impact bonds, conservation finance and other tools. Think of design under constraint just like with iPhone. We can also consider crowdfunding – $16.2 billion – compared to NSF total budget of $5.8 billion. There are other ways to harness the crowd- from ideas, to creativity, to funding. Paul Bunje – XPRIZE Foundation, considering the incentivizing innovation for conservation. Problems are increasing exponentially and solution are only increasing in a linear way and try try to find solution at huge scale. Open innovation takes lots of ideas internally and externally, and trying to find tools from all sort of areas. There are also new opportunities for identifying new sources of funding. The benefits of prizes/challenges – solve important problems, set aspirational goals – a moonshot, novel partnerships, inspire with new ideas. There are all sort of methods in open innovation, from incentive prizes or just innovation networks. Prizes continue to increase – flexibility, openness, but also the new ways in which stories are being done. Asher Jay – creative conservationist. She explore the linkage between science and stories. Humanize science – not introducing a bias, but need the link those in the know and other poeple. Content need to be contagious, and enable the individual – making the individual impact about conservation. Looking at facts and figures, and then thinking how the story evolve – what is the point, how to create protagonist/focus, which elements will be included, emotional triggers – need to think about consuming the science and then acting on it. That can be done through using existing signs, symbols, icons. There is also the issue of foreground and background to help structure the understanding. A lot of the campaign that she created are about ‘stating the obvious’ that people as they are not always aware of it. The design for the digital age is that they need to be shared – open source images mean that they are used in many ways (including tattoos). Ted Schmidt – covered Paul Allen philanthropy through ‘Vulcan’ and trying to bridge technology and conservation science. Some of the focus areas includeillegal fishing, wildlife monitroing and management, but also wildlife surveys and database. They carried out a great elephent survey – flying over 20 countries to count elephents. The data is working with IUCN to ensure that the data live on. Shah Slebe suggested the idea of the ‘internet of Earth Things’ – ability to understand how things changes in real time. Technology is a tool that can help but there are no silver bullets. We need to have be aware not about the drone but what the data is used for. The SMART – spatial Monitroing and Reporting Tool created a tool to understand conservation areas. SMART is a good model to solve problems. Technology need to be designed for the context – need to show that it can be deployed over time and in a reliable area. Lucas Joppa – the impact that people have on the planet is the anthropocene and the information age – we have a combination of having 50 billion objects linked. Levereging information technology for conservation biology is seem obvious to those who are interested in technology areas. Empowering the crowd to collect information and identify (iNaturalist), or instant wild to work with camera traps, and GPS tags on the environment – animals also involved in sensing the environment for people. Mongabay – got a section on Wildtech area. Engaging with industry – there are different partnerships with technology industry and conservations – questions for help are backward – people don’t ask for the resources of working with the talented engineers that are part of the organisation. If asking in the right way, we can get donation of time and money from the engineers. 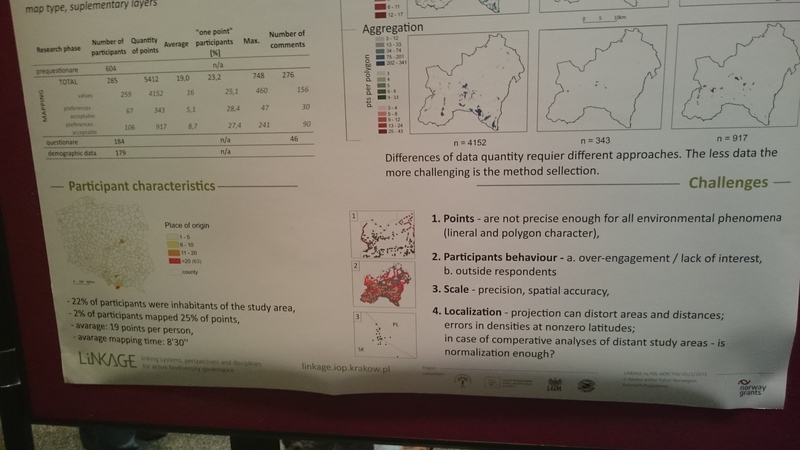 Understanding the environmental drivers of recording bias in citizen science data across Sweden Alejandro Ruete looking at biases in the data that was collected, and developing an ignorance index that let you evaluate how much you would know about a location. Earning your stripes: Does expertise aid the ability to match bumblebee images in identification guides Gail Austen-Price compared the identification abilities of experts and non-experts, showing that the ability to match is good regardless of expertise, but that experts are more careful and are willing to say that it’s not clear how to differentiate. Utilizing citizen science and new technology to improve the Palau national bird monitoring program Heather Ketebengang showed how in Palau they’ve used information from experienced and trusted birdwatchers (through systems such as eBird) with experts’ survey to create a more comprehensive picture of their bird population. Maximizing mangrove forest conservation through multi-scale stakeholder engagement in citizen science Jenny Cousins showed a long running project that have yield many benefits to all sides involved – including better local skills, academic publications and more. 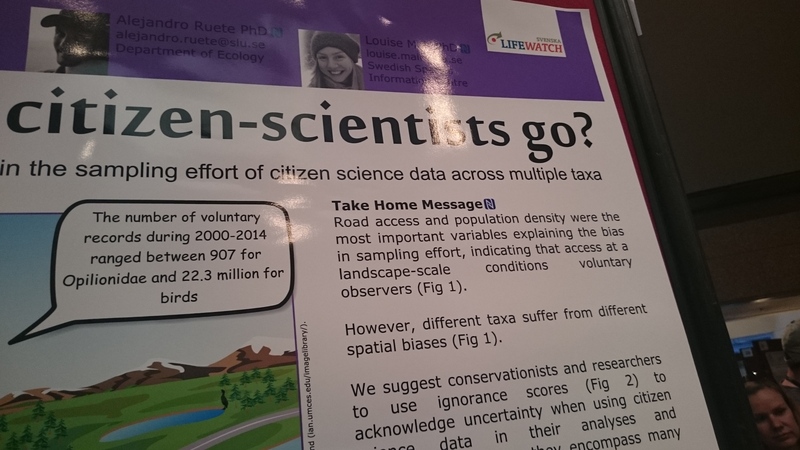 The microverse citizen science project: Collaborative microbiology research with UK secondary schools Lucy Robinson describe the work of UK NHM work which I’ve covered in the ECSITE post. 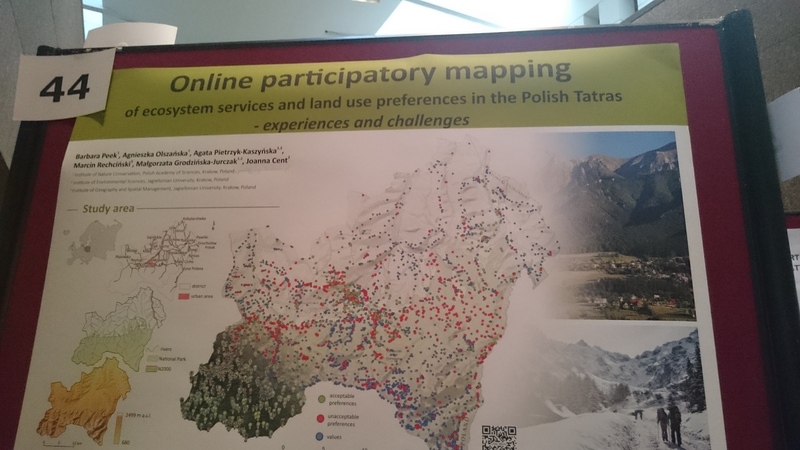 Online participatory mapping of ecosystem services and land use preferences in the Polish tatras – experiences and challenges Barbara Peek describe an online PPGIS that ask people to identify values, positive and negative activities in an area of Poland. The project had it’s own participation inequality (2% of participants putting 25% of the information) and fairly few qualitative comments, but they were useful. 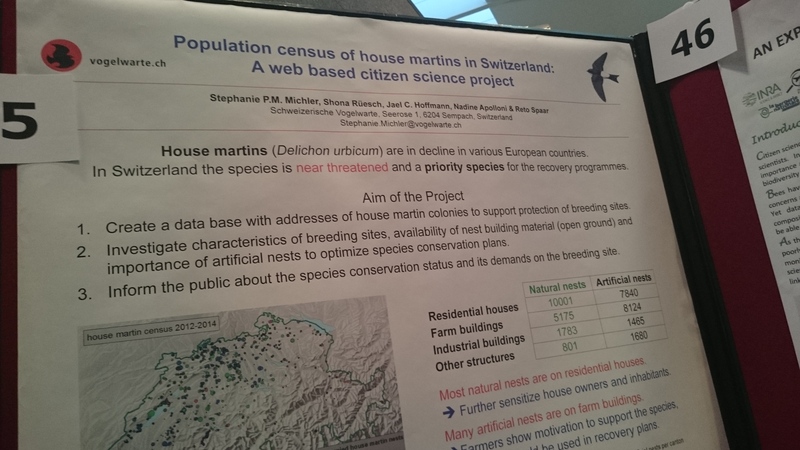 Population census of house martins in Switzerland: A web based citizen science project Stephanie Michler is an interesting project with species that people are already interested in and provided many artificial nest, so the level of engagement and activity in the project seem to be good. Within 3 years, the project presented good growth. Dealing with observer bias when mapping species distributions using citizen science data: An example on brown bears in Greece Anne-Sophie Bonnet-Lebrun show that a model that takes only roads as a proxy for where people will collect information is not good enough, so there is a need to understand where are the tourist area. Using citizen science to map geospatial and temporal trends in human-elephant conflict Cheli Cresswell show the progress in her app development to engage people in reporting on human-wildlife conflict.